In the famous words of the famous circus guy, there is a sucker born every minute! Welcome to the club, Dennis! 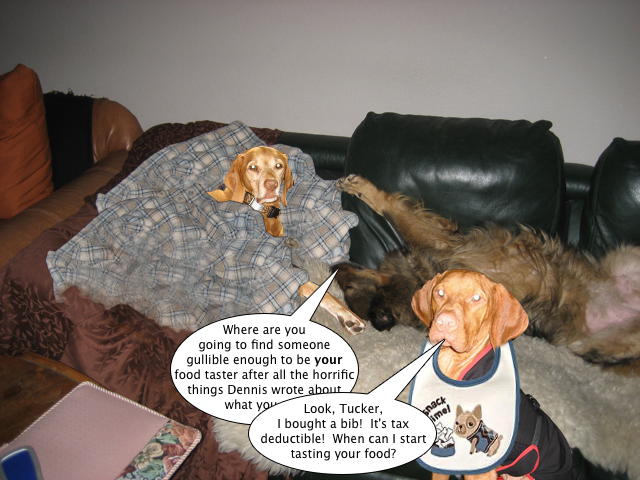 Now Tucker, hiring Dennis to be your personal food taster will do no favours for Mama & Dada’s mental health. Glad that you are feeling better! So glad to hear that Tucker is feeling better!! Just remember, Dennis & Tucker, UFOs (unidentified found objects) do not fall into the category of food (refer to your most recent public service announcement)! 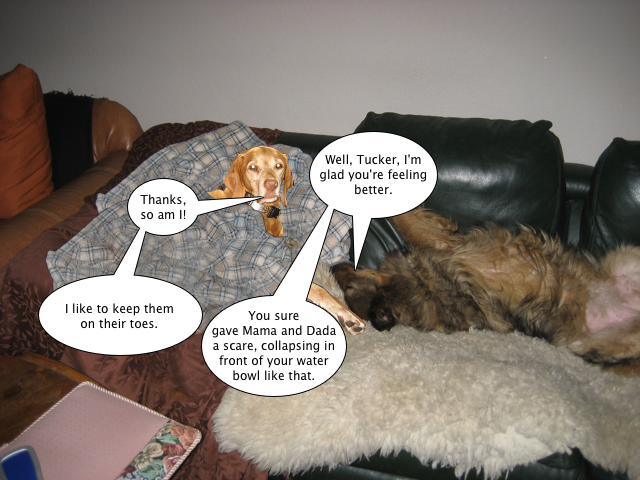 We are so glad you are better, Tucker. Too bad about all the green papers, but you are worth it. Did anyone ever figure out what you ate? We hope you didn’t tell Dennis your mom and dada were going to PAY him to taste test your food. They won’t have any spendables for ages and ages after 2 / 4 ER visits. 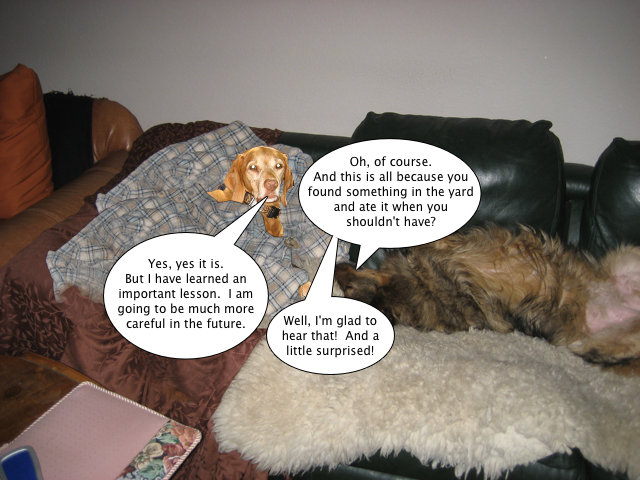 So glad to hear you are on the mend, Tucker. You should leave the taste testing to the hedgehogs. Tucker, you realize that this means you have to share… Are you sure you can stand to let Dennis have a bite of all your food before you have it? 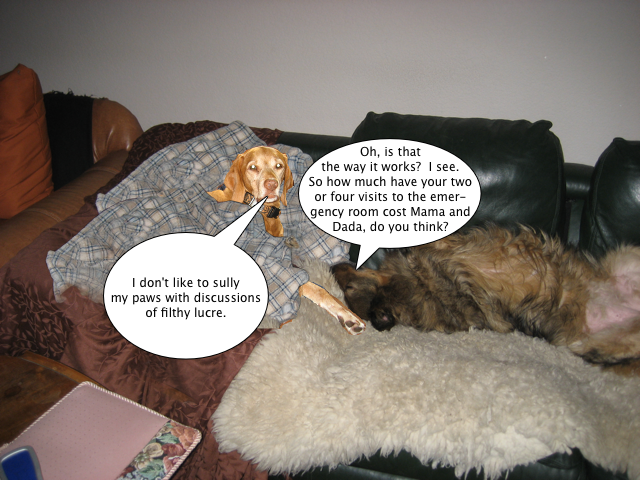 Glad Tucker is feeling better. Hope he really has learnt his lesson. If you need another food taster, I volunteer! As a Labrador, I’ll eat ANYTHING! Yesterday I stuffed myself with acorns! Oh dear! We were hoping you could avoid the ER, at least for another week! Tucker, what’s your Plan B? We suspect you’re going to need one. Be careful Dennis. 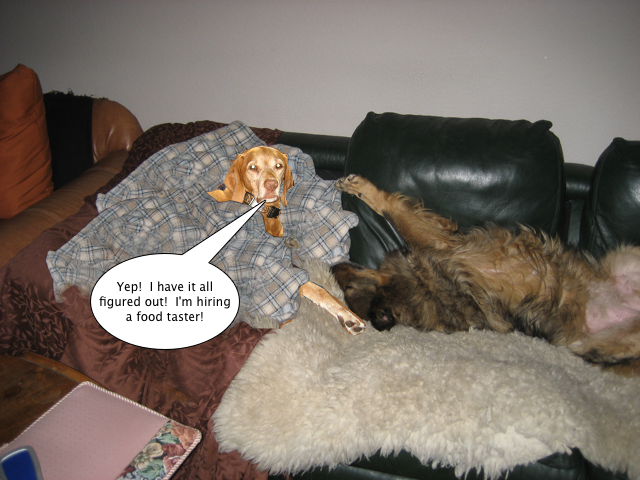 Maybe you need an assistant food taster to make sure the food for the food taster is ok. A squirrel perhaps?? ?